Universal Site Services has over 50 years of experience throughout California, and is your go-to place for commercial Long Beach parking lot sweeping. Our current clientele includes business parks, event centers, apartment complexes, shopping centers, arenas, malls, government buildings, and schools. Whether you operate a large scale shopping center or have a small storefront, we have the tools necessary to get the job done right the first time. Our fuel efficient trucks use only the latest technology to reduce dirt, dust, and litter and are equipped for whatever could possibly arise. Perhaps you’ve never had a problem with graffiti and find that your parking lot got tagged. Our graffiti abatement service can remove it fast and prevent it from occurring in the future. The better your parking lot looks, the more inclined people will be to leave their car there to go into your store or business. Not only that, a clean and well-maintained parking lot will prevent you from having to pay more money down the line for repairs. Your pavement will last longer with regular parking lot maintenance in Long Beach through Universal Site Services. Read more about how property maintenance can improve the look of your business or storefront in our blog. Not Just Sweeping, We Pressure Wash Too! 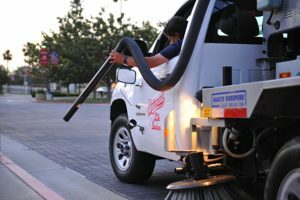 Our expert parking lot sweeping in Long Beach will not just sweep the dirt under the rug, but we also offer pressure washing services to help with the toughest jobs. We only use EPA approved soaps so you do not need to worry about your parking lot sweeping affecting your landscaping or putting your customers at risk with dangerous chemicals. Our pressure washers can clean up any level of dirt, grime, mold, mildew that could potentially lead to rot and decay, or potentially create hazards for your employees and customers. You can focus on running the day to day operations of your business, and we can take care of the presentation and health of your exterior. Day porter services make it so that a designated, well trained, and friendly representative from Universal Site Services is stationed at your storefront to clean and perform maintenance. Schedule us during high traffic times to ensure that no mess will build up without you knowing it. Our day porters won’t just maintain trash and garbage but are mostly concerned with making sure your customers and employers are comfortable and welcomed in a safe and clean environment. Uniformed day posters can also maintain restrooms, clean trash receptacles, Additionally, they can make sure that trash or recyclables find their way to the correct location. Your store will become the standard in all of Long Beach. Universal Site Services in your one stop shop for everything you could possibly need to present your business or storefront in the best possible light. Stress less about maintaining plants and foliage with our customized irrigation installation to keep any plant life looking green and beautiful, without driving up a water bill. Our landscaping services also include trimming and pruning so all plants are well maintained and never become overgrown. Whether you need us to start from scratch and plant brand new plants, or if you need help bringing back plants that were once neglected, we can handle it. Have a dead tree that is causing an eye sore? Our team can remove the tree, along with any weeds, fast and within your schedule so you do not need to worry about our work impacting your business. We have researched the best possible trees and plants that can beautify your storefront and require no maintenance on your end. You can read about trees that will not damage pavement or concrete in our blog. While saving you time and money, Universal Site Services is also making the environment a top priority. All of our vehicles are energy efficient, and our specialized vacuums do not pick up dirt and debris and immediately push it out into the air. When we say that we are clean, we mean it. Plus, we work within your schedule. Many of our services can be scheduled at any time of the day to have literally no impact on your day to day business, and will never impede on your customers or clients. Our state of the art equipment gets the job done right the first time, so you’ll never arrive the next morning and feel dissatisfied with the presentation. Our friendly and professional staff are waiting to hear from you. Simply call 1-800-647-9337, or e-mail info@universalsiteservices.com to discuss your needs and we can create a customized plan of action to fit your needs, and stay within your budget. At Universal Site Services, we are not just a business. We support our clients and want to see them succeed. Try our expert services and you will discover just how much a clean and inviting parking lot and building exterior will put your customers and employees in better moods, and keep them coming back.